It was announced last week that Hellboy would be getting rebooted in an R-rated version. Today more details have arrived including some promo art and the title of the film! 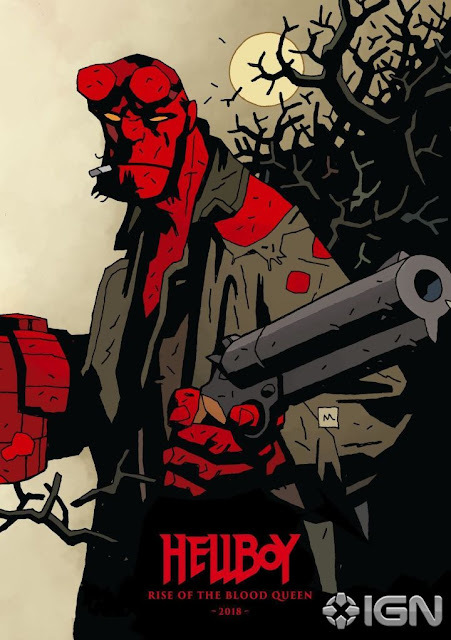 Hellboy: Rise Of The Blood Queen will be directed by Neil Marshall and star David Harbour of Stranger Things fame with a script being written by Andrew Cosby, Christopher Golden and Hellboy creator Mike Mignola. There is also promo art for the film is drawn by Mignola himself as you can see below. There have been two previous Hellboy films directed by Guilmero del Toro and starring Ron Perlman and while rumors of a 3rd film had gone on for some time that has now been laid to rest as the reboot route is being taken. Production is expected this Fall with a 2018 release for Hellboy: Rise Of The Blood Queen.